A first for The Yard this Thursday night as we stay open to bring a new late-night dimension to NOW 19, our annual festival of the best new theatre for right Now. From 10pm and after FK Alexander’s show Diana is Dead, The Yard bar will host a night of music and performance featuring composer, performance artist and sound designer Alicia Jane Turner and a DJ set from Nick Anderson. The event is free and open to anyone with or without a ticket to NOW. An optimal space for thoughts, discussion and decompression after the earlier performances or a spirited late-night spot for those looking to make a night of it. 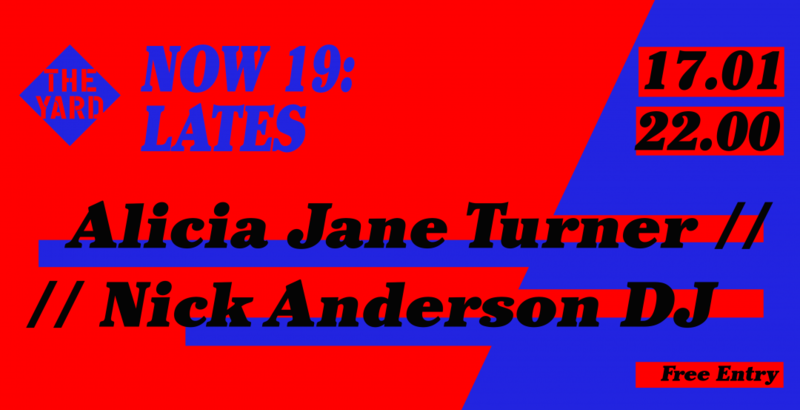 Alicia Jane Turner is a composer, performance artist, sound designer and violinist whose work spans live art, theatre, and new classical music. Her practice focuses on the visceral affectivity of sound and live music in performance, using compositions and immersive sound design to explore the relationship between the internal and external body. In her work and research she interrogates the gendered politics of listening, silence and noise, using sound to ask questions about physicality, identity and intimacy. Nick Anderson is performance artist who co-founded Glasgow’s Buzzcut, an annual five-day experimental festival intended to build a critical community for performance work in the city. Having recently relocated from Glasgow to London, Nick has taken up a place as the Artistic Programmer for the Sick of the Fringe, alongside Brian Lobel and FK Alexander. We’re excited to welcome Nick to The Yard and also to London, someone who will no doubt prove to be a huge asset within London’s contemporary performance scene. Glasgow’s loss is London’s gain.